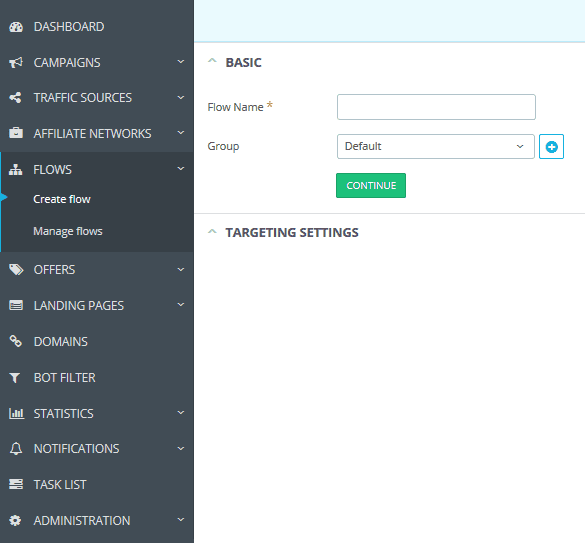 Flow is a ready-to-use targeting setting that can be applied to several campaigns at once. Targeting settings, crafted for a given flow, are used in all flow-related campaigns, causing a tremendous optimization boost. Most frequently, the flows ensure the smoother management of a large number of similar campaigns that have different traffic sources, for example. The process of flow creation comprises two steps, “Basic” and “Targeting settings”. “Flow Name” field – you can enter any flow name you want, just keep in mind that the name length should be not less than 3 characters and may contain a-z‚ A-Z, 0-9‚ — ‚ _, *, /, &, [, ], (, ), !, №, %, ?, @, #, <, >, +, period, and comma. “Group” – you can select one of the earlier created flow groups from a drop-down list and add a new flow to it. Please note that all your Flows can be found within the “Default” group. To create a group, press the “+” icon to the right of this field, enter the group name and click “Apply”. “Continue” – a click on this button enables you to input targeting settings for any given flow. Bear in mind that you can save a Flow without targeting settings, and then create them directly in the campaign when adding this flow into it. The set-up process for “Targeting settings” is the same as for the “Path” campaign. For more information on how to correctly set “Targeting settings”, check the “Create campaign” section of this User guide. In order to save all changes, click “Save”.